Nikon | Imaging Products | Best of the Rest / Nikon Family Cousins, Part 17 :"NIKONOS (I) / -II / III"
Home > Products & Support > Imaging Products > History > Camera Chronicle > Part 17 :"NIKONOS (I) / -II / III"
Part 17 :"NIKONOS (I) / -II / III"
It is a well known fact that a full-scale all-weather camera NIKONOS (see photo) launched in 1963 was not originally designed by Nippon Kogaku K.K. (present Nikon Corporation). The original was Calypso (1961), a camera which is resistant to water pressure at the depth of 50 meters, designed and made by LA SPIROTECHNIQUE well known for its diving apparatus including aqua lung. Its name Calypso is, directly, associated with the name of a marine research ship of Jaques-Yves COUSTEAU, ex-captain of French Navy who is the inventor of aqua lung and famous for his science film "Le Monde du Silence" which was much talked about underwater shooting scenes (originally it is the name of an island nymph of Greek myths). The product name of this camera for a certain area of Europe succeeded this name in the form of "Calypso/Nikkor" even at later days. It is not clearly known why this "Calypso" was to be made by Nippon Kogaku as 'NIKONOS', but it can easily be guessed that LA SPIROTECHNIQUE may have judged that, "it might be better to have some experienced camera manufacturer make than to make it by oneself", since they are originally not an optical apparatus maker (= an affiliated company of a French gas maker, L'Air Liquide S.A.). In fact, this offer of technology transfer and the right of world-wide (except EEC countries at that time) distribution was brought to Nippon Kogaku by LA SPIROTECHNIQUE. It is interesting that 'T' company, a Japanese industrial gas manufacturer mediated between two parties. Nippon Kogaku had once sold a housing for underwater photography which houses a range-finder type Nikon (Nikon S2, SP, S3 etc.) under the product name of "Nikon Marine." It was supposed to be the reason because that kind of experience was appreciated that Nippon Kogaku was selected among many optical instrument manufacturers. Then, what was the reason why Nippon Kogaku side accepted the offer of LA SPIROTECHNIQUE ? "Calypso" was a sort of camera, but it was quite different from an ordinary camera, and its market was unknown, and it must have been quite risky for Nippon Kogaku. To tell about the camera business of Nippon Kogaku, it was trying to expand the market of 35mm (135) SLR, acquired by Nikon F, by adding Nikorex 35 (1960, see Part 1.) and Nikorex F (1962, see Part 3. ), and trying to go into the field of 8mm cine camera with Nikorex 8 (1961). As a part of the business expansion, it may have been attractive to go into the field of underwater photography. 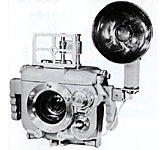 Moreover, I think, that the unique mechanism of this camera 'Calypso' has captivated the mind of technical staff of Nippon Kogaku. Surely, "Calypso" has many surprisingly excellent ideas in everywhere of its mechanism which would never occur to an ordinary camera designer. One of them was the shutter, for example. It was a vertical-travel metal focal-plane shutter, and this Calypso adopted plain and clean-cut method which guides two metal blades of the front curtain and the rear curtain by two lods and drives them by compression coil springs at the time when the "Copal Web Magazine" (see Part 3.) divided the blades into 2 of front curtain and 3 of rear curtain in order to keep the height of the camera low, and was puzzling about the driving method of blade which used the link mechanism. And another example: the mechanism that a single lever works for shutter charge, film advance and shutter release was also a unique one which would never be thought of from an orthodox camera designing technique, though it had the intention of using as few moving parts as possible in order to prevent the water from entering. When these unique mechanism of 'Calypso' are described, a man who always makes an appearance is a Monsieur Jean de WOUTERS. When I joined Nippon Kogaku and was attached to Camera Designing Dept., I had often heard of this Mr. WOUTERS, but at first, I thought this "Mr. UTA" (WOUTERS sounds like this to the ear of a Japanese) might be a nickname of a Mr. UTADA or a Mr. UTAGAWA. But, he was the man who designed the Calypso at LA SPIROTECHNIQUE, and originated a number of unique mechanisms. He invented and constructed the underwater camera Calypso-Phot, ancestor of the Nikonos. In 1948 he started his first experiment on underwater photography. In 1956 he started building the first prototypes for the Spirotechnique with Cousteau. In 1963 the patent was sold to NIKON and he started a new collaboration. He is, of course, neither UTADA nor UTAGAWA, but Jean de WOUTERS, a Belgian born in Brussels, and, as a matter of course, was involved in the production from the beginning when Nippon Kogaku manufactured NIKONOS, and was stationed in Japan from March 1964, that was the next year of the release of NIKONOS (I), to May 1965 and was engaged in the development of the next model of NIKONOS in collaboration with the design staff of Nippon Kogaku. I've heard that he was a person of noble birth and his official name was very long (Chevalier Jean Guy Marie Joseph de WOUTERS d' Oplinter). He was proud, but at the same time, amiable one and left a number of episodes. Nippon Kogaku consigned a room to his use on the 4th floor of the old building at Ohi Plant. That had been a long and narrow building called "The Leaning Tower of Pisa", but was broken down and does not exist now. In July 1964, there was a big earthquake in Niigata (About 300 km to the north from Tokyo), and quite a shock was felt even in remote Tokyo. It is said that Monsieur WOUTERS, brought up in the place where no earthquake happens, was scared with the shock and tumbled down the stairs with his pale face. The main work of Monsieur WOUTERS during his one-year-and-three-months stay in Japan was the TTL metering mechanism of NIKONOS. It was to measure the intensity of light passing through the taking lens with the light sensors arranged in the periphery of the picture frame (aperture), but it was difficult to attain with the technology at that time when the TTL metering of the SLR was still at dawn. That dream of Monsieur WOUTERS had to wait until the release of NIKONOS IV-A in 1980. At the beginning when NIKONOS (I) was released in 1963, it gained considerable popularity, as it was an unusual camera that had never existed before, but it was short-lived, and the sales fell off suddenly. The market for underwater photography have not yet grown and the total demand was not so big as was expected. The excessive inventory of NIKONOS was a serious problem, for a while, for entire Nippon Kogaku. But, about three years later, it began to move fast again and the inventory ran out soon. It was hastily decided to release a new model, and in 1968 NIKONOS-II (Photo : right) was released, with some minor modification made to the section in relation to the rewinding of the previous model. And in 1975, NIKONOS III (Photo : right) was released, which adopted sprocket for film advance (to that time, for film advance, the sprocket was not used, but winding length was adjusted with decreasing the rotation angle of winding spool) and the viewfinder was changed to bright-frame type. It was up to this NIKONOS III that the basic design of M WOUTERS was succeeded and after that it was decided to change the body construction fundamentally in order to incorporate the newest technology such as aperture-priority AE ("NIKONOS IV-A" in 1980). And up to the current "NIKONOS-V" (1984), it has been a favorite camera of divers all over the world, as you well know.